Tomas Hertl takes the PPOTN prize for his two-goal performance against St. Louis in Game 3 of the Western Conference Final. The centreman started the scoring in the first period and finished it in the third, helping the Sharks to a 3-0 home ice win over the Blues. STAT PACK: Hertl took four shots, blocked one, recorded four hits and had 25 shifts in 17:46 of ice time. HOCKEY NIGHT IN PRAGUE: Hertl attended the 2010 NHL Premiere in Prague (Boston Bruins vs. Phoenix Coyotes) – his first live NHL game. MOVES LIKE JAGR: Hertl’s hockey idol growing up was fellow Czech Jaromir Jagr. FOUR SCORE: Hertl lit the lamp four times in a 9-2 Sharks win over the New York Rangers, on October 8, 2013. CATCH A DRAFT: Hertl was drafted 17th overall in 2002 by the Sharks. Other notable No. 17 picks include Kevin Hatcher, Bobby Clarke, Brent Sutter, Barret Jackman and Zach Parise. SHARING A DAY: Hertl shares a birthday (November 12) with actor Ryan Gosling, actresses Anne Hathaway and Grace Kelly, NBA superstar Russell Westbrook, singer Neil Young and PGA golfer Jason Day. HONOURABLE MENTIONS: Joe Thornton had two assists. 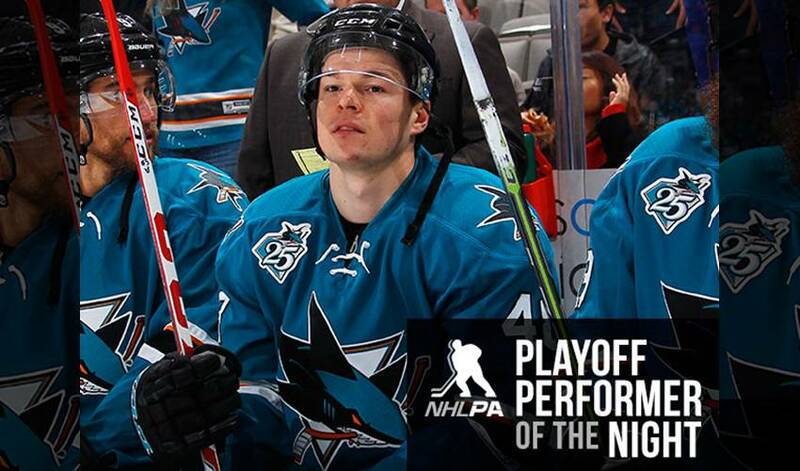 Joonas Donskoi scored his fourth of the playoffs. Martin Jones made 22 saves for his second straight shutout.